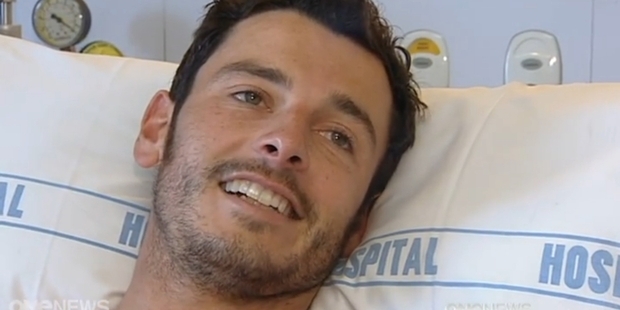 A SURFER who pushed a shark away after it bit into his leg says he was so scared that he never wanted to see water again. A shaken Darren Mills said, "When it first happened I was like, I'm not even getting in the bathtub again." However, he is determined not to let the attack get the better of him and plans to go surfing as soon as he can. "I love it, you know, I just want to get back and just surf again." The 28-year-old was on his surfboard at Porpoise Bay Beach in Southland when a shark, which he believes was a great white, attacked on Friday evening. Mr Mills was counting himself "really, really lucky" last night despite three deep bites in his thigh and calf. Speaking through tears, Mr Mills told One News from his hospital bed how he frantically tried to fight off the attack. "I tried to punch it but it was more like a push." The shark let go, leaving Mr Mills floating 50m from shore with a bleeding leg. "I was pretty scared that it was going to come back but it didn't." He was able to make it back to shore on his surfboard, which showed several deep bite marks. Mr Mills was flown by rescue helicopter to Southland Hospital. "There's a puncture wound just below my knee, which might've gone, or has gone through a tendon," he said, "and then there's four lacerations up my leg to the top of my thigh." Twelve days before the attack, Mr Mills shot a promotional video in which he piloted a submersible shark vehicle at Lake Wakatipu.